Cobalt plays a critical role in the future of clean energy; a fact that isn’t escaping savvy resource investors. It’s not like it’s easy to ignore. Rising demand coupled with supply issues is reflected in the sharp jump in the cobalt price over the past twelve months. Rallying sharply from a low of US$10/lb in 2016 to more than US$27/lb today, cobalt has been the year’s standout commodity. The price rise is backed by solid fundamentals which are only going to continue. Cobalt is a critical component in the manufacture of rechargeable lithium-ion batteries, which is where half of the world’s cobalt production is used. And that demand is increasing backed by the massive growth that’s ahead for renewable technologies and electric vehicles (EV) in particular. EVs alone will demand massive amounts of cobalt to keep up with rising demand. It is estimated that every sixth car sold in 2020 will be electric and that sales of electric cars and plug-in hybrid vehicles will hit 17 million in 2030. That’s a huge leap from the 778,000 EVs sold worldwide in 2016. With this kind of growth, you might expect resource companies to be rushing into cobalt production. It’s true that many are adding cobalt to their existing operations. Nickel and copper producers, in particular, are increasingly mining cobalt as the payoff becomes more and more tempting. Today’s company could tick the boxes. Having listed on the ASX today, this small cap explorer is focused on the lucrative business of cobalt, without the distraction of other commodities, and it comes with an existing JORC 2012 Mineral Resource of 500,000t at 0.17% cobalt. The high-grade of 0.17% cobalt comes in well above the average grade seen in Australia of 0.11%. This is a speculative investment however and investors should seek professional financial advice if considering today’s company for their portfolio. On top of that, it’s in the mining friendly jurisdiction of Australia’s Northern Territory. That location in itself is a major draw as manufacturers of renewable technologies scramble to secure ethically mined cobalt supplies from politically stable jurisdictions. Currently, more than half of the world’s cobalt supply comes from the Democratic Republic of Congo (DRC), where there are ethical and sovereign risk concerns. 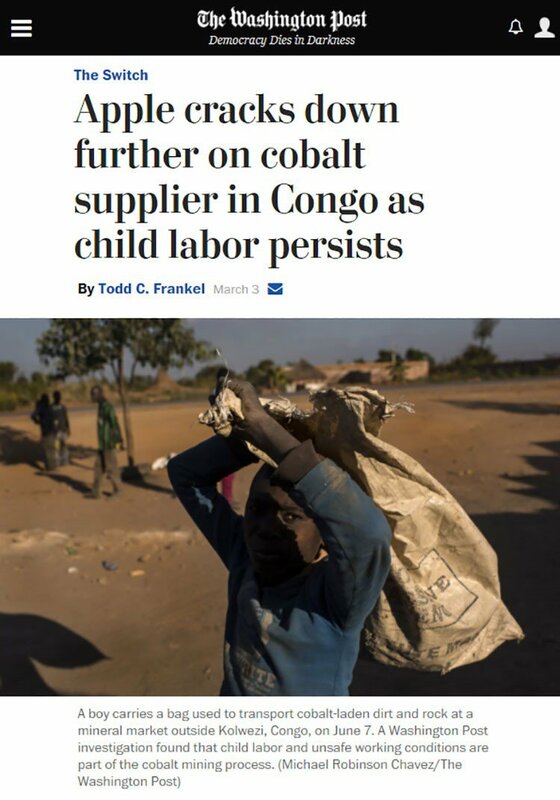 Major multinationals are coming under increasing pressure to secure ethically sourced cobalt for the manufacture of their products, and Apple and Tesla, for example, have made a conscious effort to find alternative sources to DRC-mined cobalt. This leaves a gaping supply hole to be filled by producers in first world mining friendly jurisdictions... including Australia. All this comes as cobalt demand surges, and as the rise of new and innovative technologies — such as rechargeable batteries and electric vehicles — begin to gain traction. The investment potential on offer from cobalt stocks isn’t new to readers of The Next Mining Boom, yet this company has a unique and targeted approach...the benefits of which include lower costs of production. Worldwide, there are very few specialty cobalt producers, with 94% of all cobalt produced being the by-product of nickel and/or copper mining with cobalt refined from a concentrate. That means just 6% of all cobalt comes from projects that are solely focused on mining cobalt. This leaves few options for small cap investors who are searching for a focused investment exposure to an up-and-coming cobalt junior. Today’s company has identified the significant upside potential in supplying much needed cobalt and is honing in on cobalt, and cobalt alone. Once it has its cobalt production up and running, this strategy will prevent the watering down of its profit margins by being leveraged to the price cycles of other commodities. This doesn’t mean the company is narrowly focused however. The company intends to look at other commodities in the cobalt cycle if and when they make economic sense. As early as next week, it is set to begin drilling at prospects that were previously explored in the 1990s. The cobalt potential was overlooked at the time, as it was not then the ‘in-demand’ commodity that it is today, commanding premium prices. 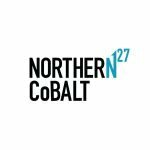 Northern Cobalt (ASX: N27) began trading on the ASX today after raising $4.2 million during its IPO. Those funds will support its exploration endeavours for the coming two years and, of immediate relevance, a drilling programme that is scheduled to kick off next week. N27 has a clear strategy to focus on developing cobalt assets at its Wollogorang Cobalt Project in the Northern Territory’s north-east corner. The Wollogorang Cobalt covers 1,131 square kilometres on pastoral land, wholly within the NT pastoral lease of Wollogorang Station, in the territories north-eastern corner. The Wollogorang Project portfolio of tenements comprises three exploration licences: the Stanton Prospect/Running Creek – EL 31272, Selby Prospect – EL 30950, and Karns – EL 30496. These are outlined on the map below and detailed in the following table. N27 commissioned an independent assessment of the historical cobalt-nickel-copper Resource at the Stanton Cobalt Deposit and upgrade it to JORC 2012 compliance. Prior to this upgraded Mineral Resource, and under the old JORC code, the Resource had been significantly larger. Back in the 1990s, the Stanton Resource was defined by RIO (known as CRA Exploration Pty Ltd at the time). RIO estimated and in house non JORC resource larger than the current JORC Resource, however under the current JORC Code the resource has been significantly reduced. The potential for N27 is to undertake additional drilling at Stanton with the aim of expanding the resource. The first mineralisation was discovered in the area by Mt Isa Mines Limited who mined copper from a small open pit in the 1930s. Then in the late-1980s breccia pipes were identified in the region. CRA joint ventured into the project between 1990 and 1996 undertaking an extensive amount of exploration including 21,468m in 290 drill holes, various geophysical surveys, soil geochemistry and metallurgical testing. When CRA merged with Rio Tinto in 1997, the project was no longer a focus for the company and it was divested to Chemmet Pty Ltd, who commissioned a resource calculation between 1999 and 2000 along with a scoping study for development options. 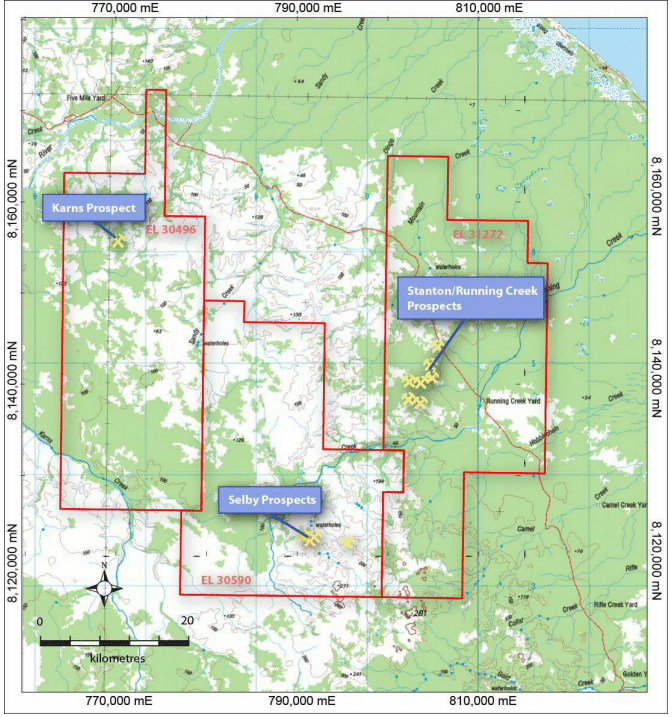 The map below highlights the Stanton-Running Creek cobalt-copper-nickel prospect locations. A total of 290 holes have been drilled to test for cobalt. The mineralisation present at Stanton is cobalt dominant, at surface, and open in a number of directions. Sulphide concentrate has been produced via conventional flotation in historic testing. One of the expansion targets at Stanton is the cobalt mineralisation that sits under the Upper Domain, shown in the above cross section. Historic drilling has reported intervals including 10m @ 0.3% cobalt under the current resource. 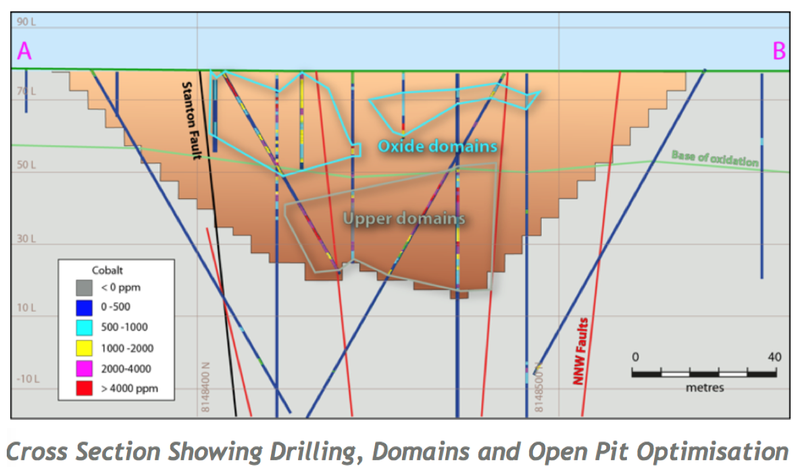 It is important to note that even this deeper mineralisation is still relatively shallow at only 90m depth. N27 asserts that there is opportunity for infill drilling for expansion. It can expand laterally and below the current depth of 60 metres to around 100 metres. N27 is wasting no time in getting to work on the project. After its ASX listing today, it is set to begin drilling next week with the goal of building its Resource back up during the remainder of the year. Drilling approvals have been received and the drill rig is ready to go. From the initial phase of exploration N27 hopes to increase the global Mineral Resource inventory at Wollogorang to a size within the independently defined Exploration Target of 2Mt grading 300ppm cobalt, 80ppm nickel and 5,000ppm copper to 10Mt grading 1,200ppm cobalt, 600ppm nickel and 3,000ppm copper (JORC 2012). 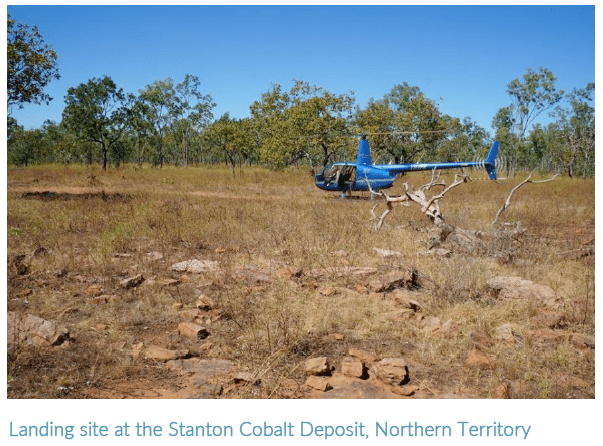 The secondary objective will be to upgrade the Inferred Mineral Resource at the Stanton Cobalt Deposit to the Indicated Mineral Resource category status. 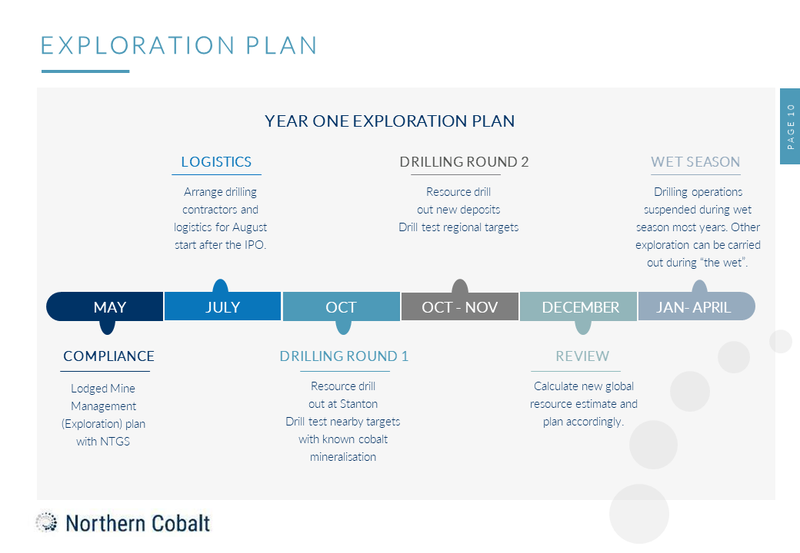 The initial drilling program to be completed by the end of 2017 is designed to drill test eleven prospect where cobalt has previously been reported. This will be followed at a later date by drilling of the additional 10 targets. Once these targets have been achieved and based on exploration results N27 aims to quickly move to assess potential development options for the project. Why the focus on cobalt? N27 is one of a unique few cobalt juniors as it is squarely focused on cobalt alone. Traditionally, companies producing cobalt do so as an add-on to their nickel or copper operations. Processing cobalt as a by-product is an expensive method, which N27 is able to avoid. Nickel laterite, along with copper nickel sulphide are being promoted by others as cobalt projects, but these can be relatively capital intensive and are leveraged to the nickel and copper prices. N27 has its sights set on cobalt due to its supply-demand imbalance and long term growth potential as lithium-ion battery continues to expand. Commodity markets are cyclical, and at first glance one might assume that the recent cobalt price action is nothing more than a cyclical high. Yet on closer inspection, it is clear that a fundamental shift is taking place when it comes to cobalt and its application in energy storage. With its high temperature resistance, hardness and wear characteristics, cobalt has long been used in the manufacture of superalloys, hard metals and diamond tools, special steels and alloys, and magnets. Today, cobalt is also a critical component in the cathode of rechargeable lithium-ion batteries. Cobalt’s use in battery making is highly valued as the metal helps allow electric cars to extend their range between charges. In fact, over half of all cobalt supply is used to make rechargeable batteries, which are used in portable electronics, energy storage systems, electric vehicles and many other applications. Combining this rise in demand, with the challenge of sourcing adequate ethically mined cobalt, we are seeing a paradigm shift and a solid argument as to why cobalt prices could continue their sharp rise north. 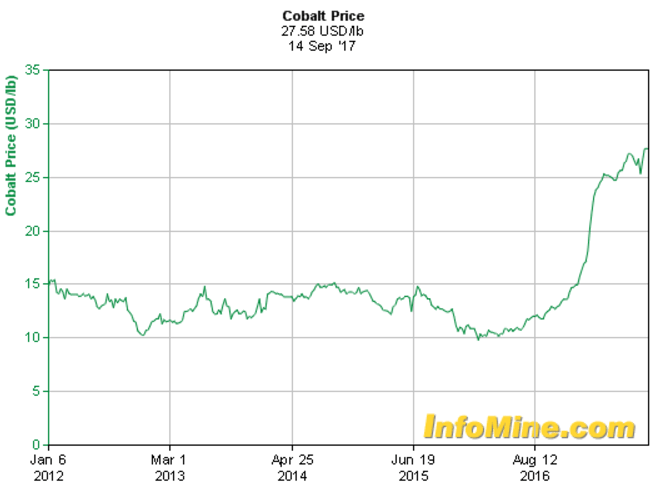 Already, the cobalt price had risen rapidly, from a low of US$10/lb in 2016 to US$27/lb today — just a year later. Yet even after such a rise, cobalt remains at half the price of its high in 2008 of $52/lb. Commodity prices do, however, fluctuate and caution should be applied to any investment decision here and not be based on spot prices alone. Seek professional financial advice before choosing to invest. The 2008 cobalt price spike was caused by political instability, including the threat of a civil war in the DRC. With over half of the world’s cobalt reserves and more than half of current cobalt production coming from that region, political instability can have massive impacts on the supply-demand balance, and therefore on cobalt prices. Located in the first world mining jurisdiction of Australia’s Northern Territory, N27’s Wollogorang Project comes with none of the sovereign risk or ethical and human rights concerns that come with operating in many of the world’s major cobalt producing regions. With cobalt resources still concentrated in the DRC, the country accounts for more than half of the world’s production, where it is primarily a by-product of copper mining. 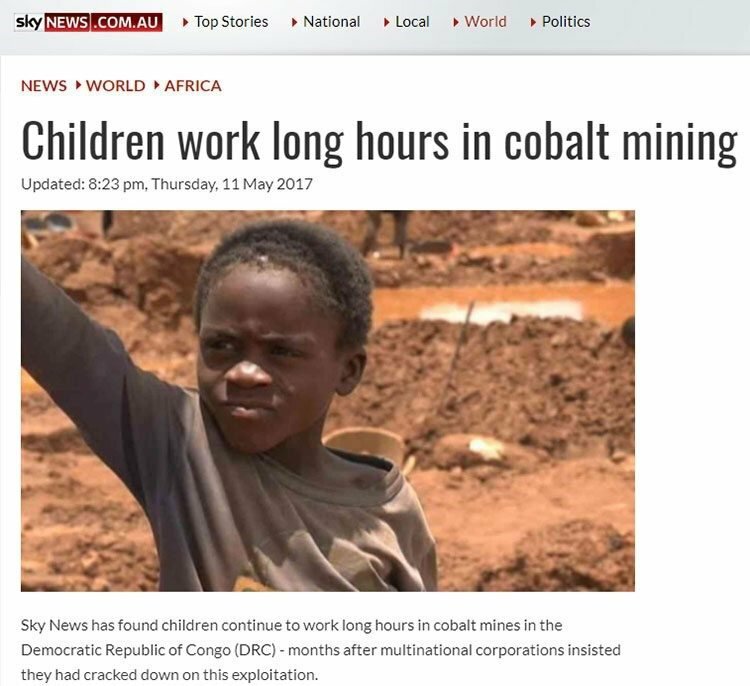 But cobalt mining in the DRC has been connected to reports of serious human rights abuses , including the usage of child labour and harsh and dangerous working conditions. On top of that, there are sovereign risk concerns for producers operating in the politically unstable country. With the other producing nations being mainland China, Zambia and Russia, each of which carry their own political risks and economic risks for cobalt buyers, there is a real need for new reliable cobalt supply. The industrial importance of cobalt and the concentrated supply in the politically unstable West African countries, has led to cobalt being classed as a strategic mineral by the US Geological Survey (USGS) and as a critical raw material by the EU. Finding alternate sources in first world mining jurisdictions is crucial to meet rising demand. Manufacturers are desperately seeking ethically sourced cobalt supply to meet the growing demand for renewable battery powered devices, and EVs in particular. A number of end users of lithium-ion batteries, including Tesla and Apple, have indicated their preference for using ethically mined cobalt from other countries. This has the potential to create a large supply deficit. Operating in Australia, N27’s Wollogorang Project avoids all the potential geo-political risk that could arise in major cobalt producing countries like the DRC, Zambia and Russia and if it gets cobalt production up and running it will offer a viable ethical alternative. N27’s plan for the remainder of the year through to 2018 includes the drill programme that is scheduled to kick off next week at Stanton, plus testing nearby targets with known cobalt mineralisation. The drill programme starting next week will take about one month to complete. After that N27 will drill test regional targets prior to the wet season. The project’s location in north-eastern NT means that the area is seasonally inaccessible due to rain and wet ground, and that work possible in the dry season between the start of June and the end of October in most years. Come late November to December the company will review the findings from its drilling, including publishing assay results and calculating a new global Resource estimate. By the time N27 gets the new global Resource, it should be time to begin drilling again. Already, N27 has recognised that the opportunity exists in this area to further extend the mineralised system which could lead to conversion into additional Resources. It is however early stages in the life of this company, so investors should seek professional financial advice if considering this stock for their portfolio. Not wanting to be a one hit wonder, during the wet season, while also completing assays, N27 will use the time to investigate potential future cobalt projects in first world mining jurisdictions. The project offers lots of exploration upside and excellent potential for expansion in the immediate vicinity of the Stanton Resource. 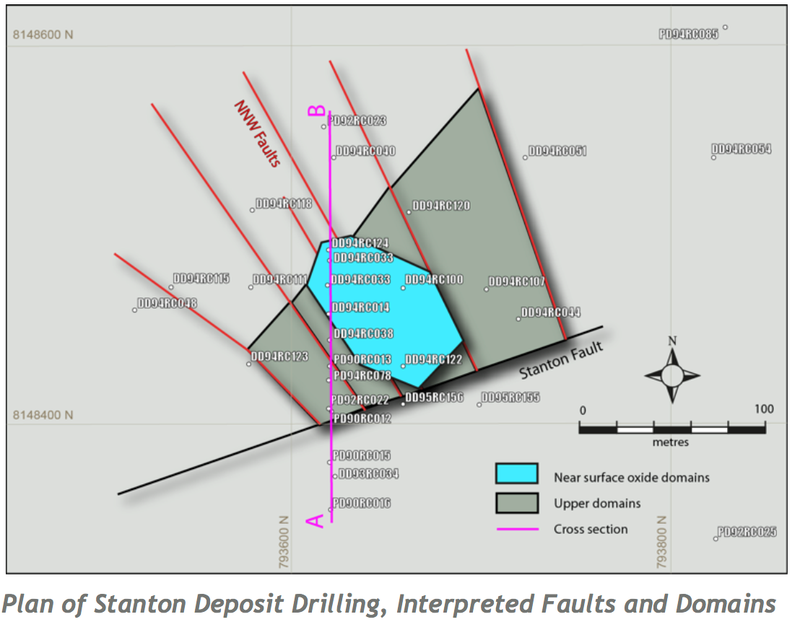 It is defining a series of satellite deposits around Stanton and identify those that are economic to mine. 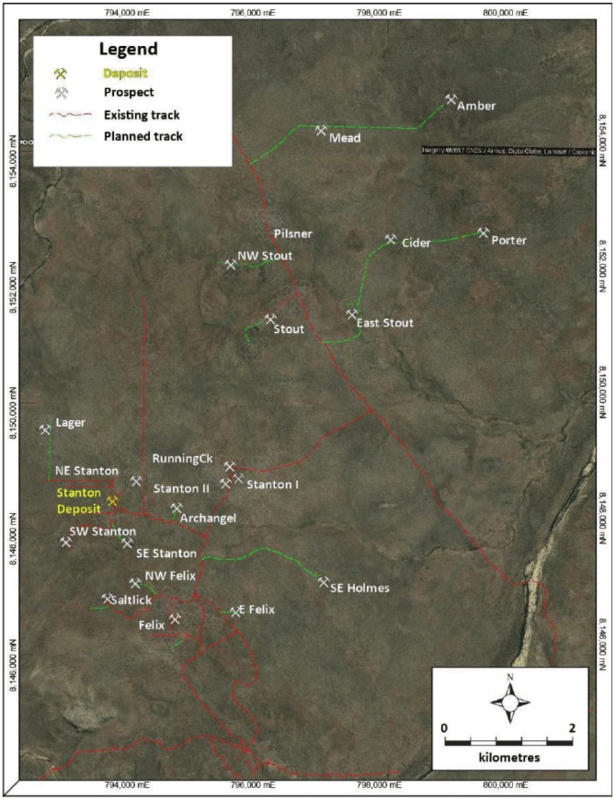 The company has an Exploration Target (JORC 2012) in the immediate vicinity of the Stanton Resource of 2 Mt grading 0.03% cobalt, 0.008% nickel and 0.5% copper to 10 Mt grading 0.12% cobalt, 0.06% ppm nickel and 0.3% copper. Once it has done all it can at Stanton, N27 see more blue sky at the Selby Prospect. Backed by a favourable supply-demand outlook, with the company focused on cobalt alone, operating in a first world mining jurisdictions, N27 could prove to be an excellent entry for small cap commodity investors wanting an exposure to cobalt. Plenty of news flow is scheduled over the coming months, with the company well-funded and keen to further its exploration pursuits at Wollogorang in the near term while looking to other future target opportunities.